Synthetic peptide corresponding to Human Oct4 aa 300 to the C-terminus (C terminal). Our Abpromise guarantee covers the use of ab27985 in the following tested applications. WB Use a concentration of 1 µg/ml. Detects a band of approximately 45 kDa (predicted molecular weight: 39 kDa). ab27985 recognizes Oct4 in human embryonic stem cells. The upper panel shows DAPI staining while the lower panel shows ab27985 staining. The antibody recognised a band corresponding to Oct4 in mouse and human embryonic stem cell lysates. 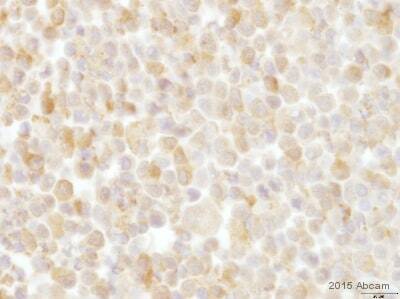 ab27985 staining Oct4 in human embryonic carcinoma cells by Flow Cytometery. Cells were fixed in paraformaldehyde and permeabilized in saponin buffer. 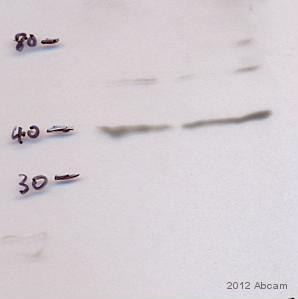 The primary antibody was diluted 1:500 (PBS + 10% BSA) and incubated with sample for 1 hour at 4°C. A FITC conjugated Donkey polyclonal to goat IgG, diluted 1:200 was used as secondary. The red histogram is secondary only control whilst green and blue repersents Oct4 expression in untreated and partially differentiated with 10nM Trans-Retinoic acid for 14 days. ab27985 recognizes Oct4 in mouse embryonic stem cells. DAPI staining is shown in the top panel while ab27985 staining is shown in the lower panel. Publishing research using ab27985? Please let us know so that we can cite the reference in this datasheet. Thank you for the details provided. I am sorry you are having difficulty with these products. Having reviewed this case, I would like to offer some suggestions to help optimize the results from ab27985 and ab96916. 2) Add a no primary control to see if the background is from the secondary. If it is, you may wish to use 10% rabbit serum instead of 5% BSA to block background from the secondary. 3) Try increasing primary antibody incubation to ON at 4C to ensure specific signal is strong. 4) Add extra washes after primary and secondary to reduce background. helpful based on the information I've provided? 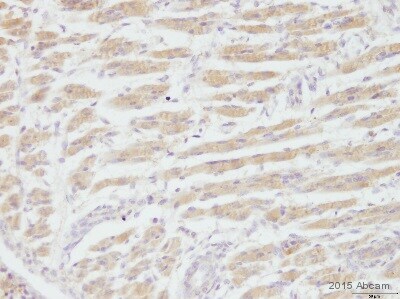 Based on the information we have for this antibody, it may be that it is not suitable for IHC-Fr on sections. However based on the information you have provided, you could try to increase the primary antibody concentration to a 1/50 dilution and incubate overnight at 4C. I have also attached the Abcam protocols book that contains more useful information on troubleshooting with IHC-Fr. No staining in fixed frozen human tissue sections. Thank you for your call today and for letting us know about the trouble with these antibodies. This article isn't specific for Brdu pre-treatment but it might be a helpful resource for you if you'd prefer to try a heat denaturation before using the HCl method. I've found another article (attached) which will useful for heat denaturation as well. I look forward to hearing from you. Please let me know if you have any questions or if there is anything else that we can do for you. We ordered the primary antibody Anti-Oct4 antibody - Embryonic Stem Cell Marker (ab27985) a while ago. Now we want to have secondary antibody Rabbit polyclonal to Goat IgG ab28445. But this ab28445 is not available anymore. 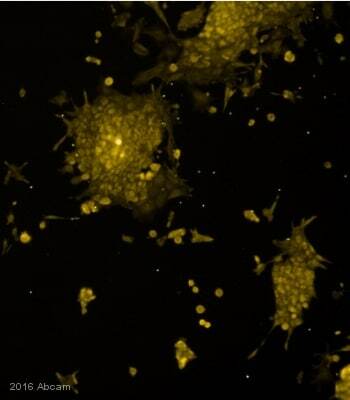 Could you please introduce to me another secondary antibody that subtitutes ab28445? I want to use this secondary antibody for both Western Blot and Immunocytochemistry. Thank you for contacting us. The closest match we have to ab28445 is ab96930. This is an anti-goat IgG, raised in rabbit, conjugated to DyLight® 650, which has an excitation maximum at 654nm and an emission maximum at 673nm. The Alexa Fluor 680 fluorophore of ab28445, on the ohter hand, has an excitation maximum at 680nm and emission at 702nm. Both are in the far red range of the visible light spectrum. Click here (or use the following: https://www.abcam.com/index.html?datasheet=96930). Please do not hesitate to contact us if you need any more advice or information.